Combine eggs with green onions and 1/4 cup cotija cheese. Heat olive oil in a baking dish. Add egg mixture to baking dish, lower temperature to medium heat and careful beat the eggs for a few seconds. Let cook without beating. While the eggs cook, peel and cut the avocado. When the eggs are almost cooked, top with slices of avocado. Cover with the tablespoon of cotija cheese and place the baking dish in the oven for 5 minutes. Meanwhile, mix tomato, red onion, serrano chile, coriander, and lemon juice and salt. After five minutes, remove baking dish from oven and serve immediately. Serve with the fresh salsa. If you have any leftover cotija cheese, grate it and refrigerate it in a sealed container. You can prepare the salsa ahead of time and keep it in the refrigerator. A frittata is an easy and quick dish to make. They always add a special touch to the table with different colors and the delicious aroma. 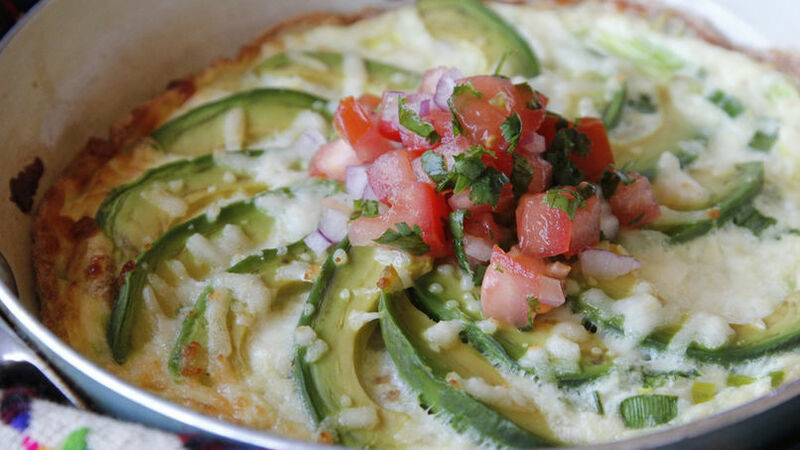 If you don’t know what a frittata looks like, it’s similar to a Spanish tortilla or an open face omelet. They are very versatile and it’s fun to create new flavors with a combination of various ingredients. The one I’ll show you today can be made in no time and includes two of my favorite ingredients, avocado and cotija cheese. Enjoy!